Company ownership can have a huge impact on company operations and decisions. 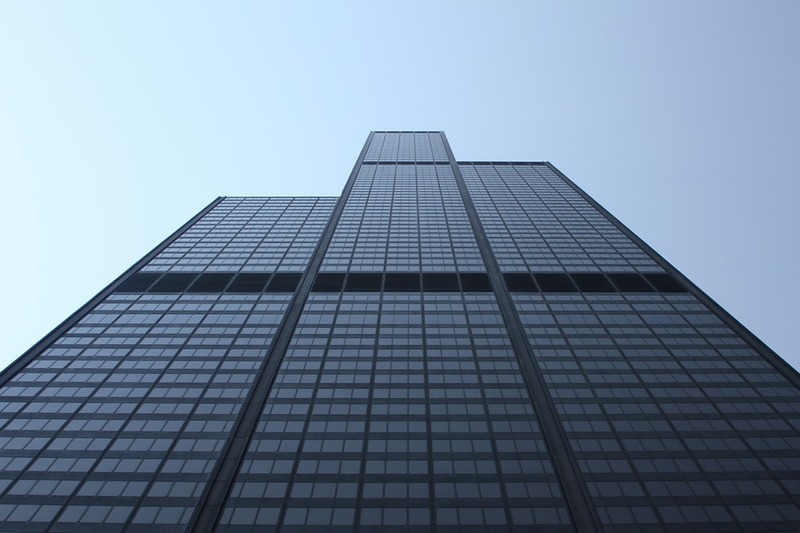 A company’s owners are its shareholders – so in the marketplace we have companies of all shapes and sizes – from small (mostly privately-owned) companies with one or two owners through to giant publicly-listed corporations with tens of thousands of owners. If you want to research a company’s shareholders, several of MIRC’s resources will be of interest to you. For publicly-listed companies worldwide, try Thomson One and Bloomberg. For privately-owned companies in the UK and Ireland, use Fame. Before logging into Thomson One, please ensure you are using Internet Explorer and your pop-up blocker is disabled. Search for your company by name and let the Company Overview load on-screen. Remember that Thomson One only holds data on publicly-listed companies. Scroll down to the Ownership Breakdown on the right-hand of the page. Beneath that, you can view details of the company’s top five shareholders. 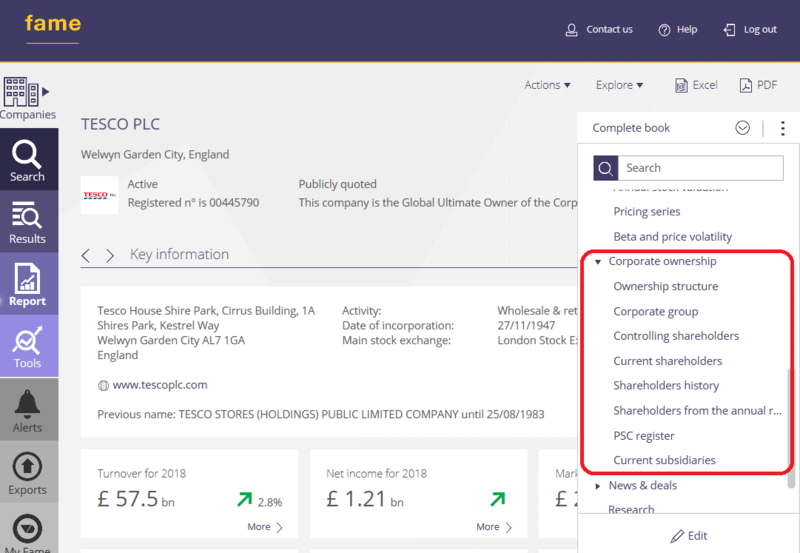 Then click through to the comprehensive Ownership Summary where you will get a more detailed breakdown of the firms and funds that own shares in the company. On each of the Firm and Fund tabs you will get a breakdown by investor type, style and location, rotation and turnover. The Non-Holders tab shows the investors that are not holding stock/shares in your chosen company but are holding shares in its peers based on certain parameters. Before using Bloomberg, you will need to create a Bloomberg account. Check out our Bloomberg basics post too if you are a first-time user or – ideally – contact MIRC and arrange for some introductory hands-on training on the terminal. 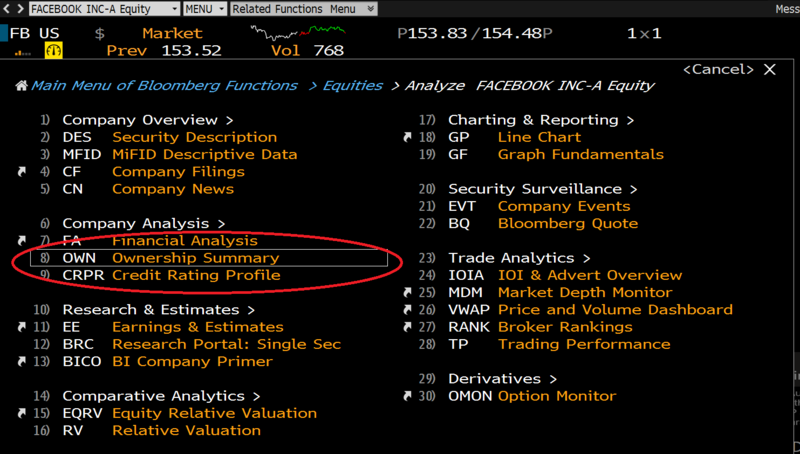 Access the Ownership Summary for any publicly listed company from its Equities menu, or use Bloomberg code <OWN>. 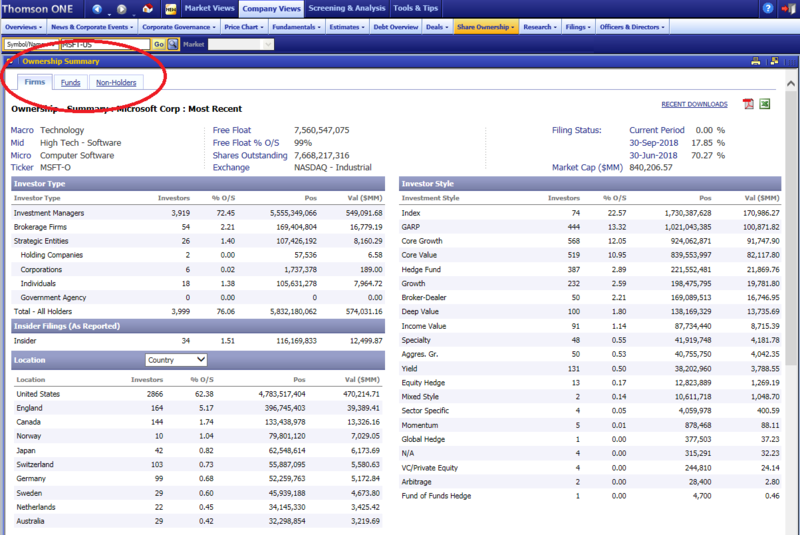 In this example we are looking at the company Facebook, Inc.
On the Ownership Summary page, you will find top-level statistics allowing for analysis of institutional holders, insider transactions, geographic ownership and ownership type (investment, hedge fund, individual, government, etc.). 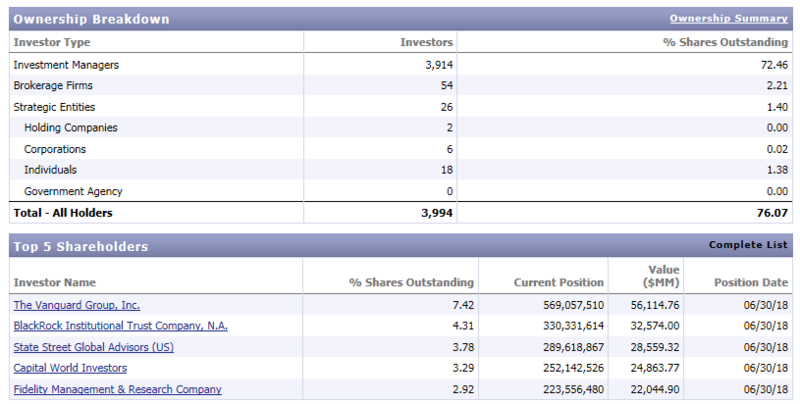 Click on any of the white headings for a percentage breakdown of share ownership within that particular category. 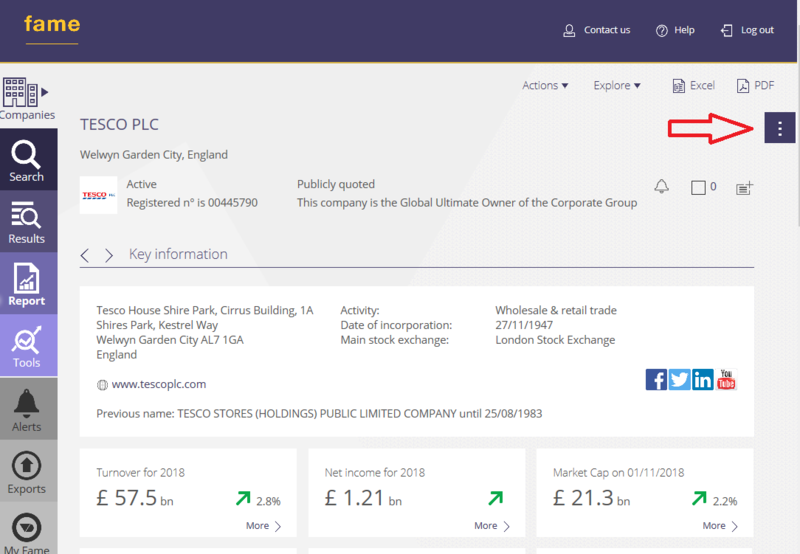 We can see from the screenshot above that 80.54% of shares in Facebook were held by US-based holders and 5.96% by UK holders on the accessed date. We can compare these figures against another date by entering it in the orange ‘Compare Current Stats Against’ date box at the top of the page. If we were interested in insider transactions, the tab of the same name will display a graph of such transactions and list the largest of these. To switch to data view, click on ‘Table’ at the top right of the graph. 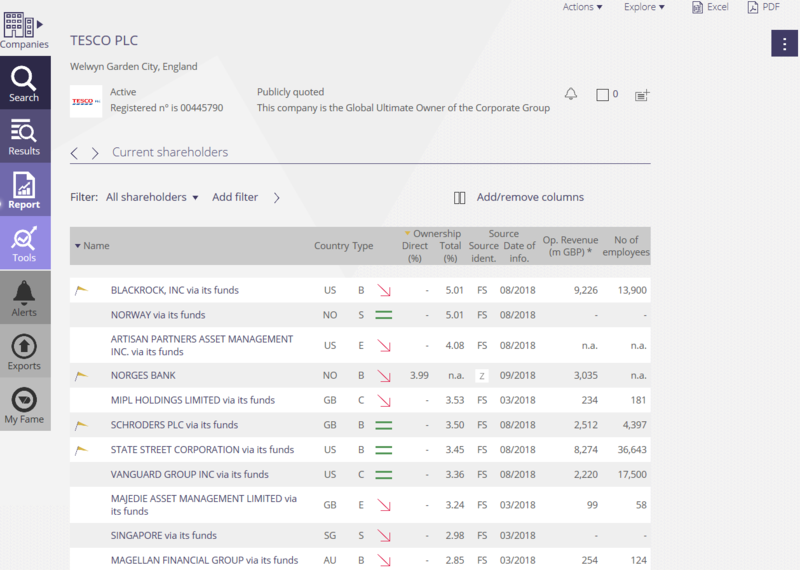 To view current shareholders, select the ‘Current’ tab which will list holders according to how many shares they own. Institutional holder names can be expanded into individual fund families and funds. This page will also allow you to search for individual holders. To export data to Excel, first ensure that you have installed the Bloomberg Excel Add-in (instructions available here) then click on ‘Export’ on the red menu bar. Select the criteria required and click on ‘Export’ at the bottom. For companies in the UK and the Republic of Ireland (private companies in particular), Fame is your best source. Search for your company in the top search box. Within each company record you will find ownership information (both current and historical), information on corporate structure, including subsidiaries, the Global Ultimate Owner’s (GUO) details and the evolution of shareholders’ ownership. From the company’s cover page, click on the dots icon on the right to open the report’s table of contents. Within the Table of Contents, scroll down to the Corporate Ownership section and select the area you require from the options. The Current Shareholders page will display shareholders of all kinds in order of importance. For those shareholders included in our Fame subscription, you can click through to their profiles. If you have any further questions about where to find details of company ownership or any other financial data you require, please do not hesitate to contact MIRC.